Last summer when we were in Vermont I editorialized about the advantages of taking along a tent and associated gear in the Airstream. I recognize that many people bought their RVs specifically to avoid sleeping on the ground in a tent, but I still have fond memories of many backpacking trips in the northeast. So once in a while I do like to get out of the trailer and into a tent. For me, tenting is a more realistic camping experience. Our Airstream has all the comforts of home, and we can live in it indefinitely. The tent has hardly any comforts beyond very basic shelter and a place to sleep. This is part of the attraction: it’s a way to really “get away from it all.” How can you get away from it all if you bring it all with you. A few days of deprivation makes a person more grateful for what they have. It’s also a great way to force a change in perspective. The tent requires setup, and careful procedures to avoid a night of mosquitoes, condensation, or discomfort. The bathroom is a hike away, either in a primitive pit toilet or off in the woods somewhere. Meals are en plein air whether it is raining or not. You have to toss out all your assumptions about the benefits of modern life and figure out basic survival; This task occupies your thoughts so thoroughly that the trivialities of work and the fine points of personal hygiene become distant secondary concerns. This description is probably horrifying to 99% of the people who are reading this. That’s OK. If you remember tent camping, perhaps as a Boy or Girl Scout, you probably have a few wonderful stories about things that happened to you. Maybe you’ve got a bear-in-the-campground story, or one about the leaky tent, or getting lost in the woods. As traumatic as those events may have been at the time, you probably also recognize that your life would not be as rich as it could be without them. Adam and Susan instigated a tent camping trip for me last week. They (rather rashly) accepted an invitation from our mutual friend Bert Gildart to join him in hiking Alaska’s famous Chilkoot Trail. This is about 30 miles of historic trail from the Gold Rush period, which Bert intends to document for his future magazine articles. Adam and Susan, admitted tenderfoots, bought all the necessary gear for five days of backpacking in Alaska’s wilderness but haven’t had a chance to actually use it. Given that their adventure with Bert is looming, it seemed wise to at least tent camp a few days beforehand. 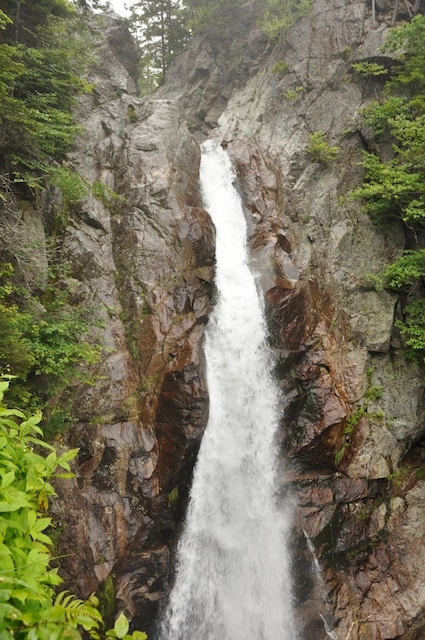 We were planning to hike to several waterfalls in the area. 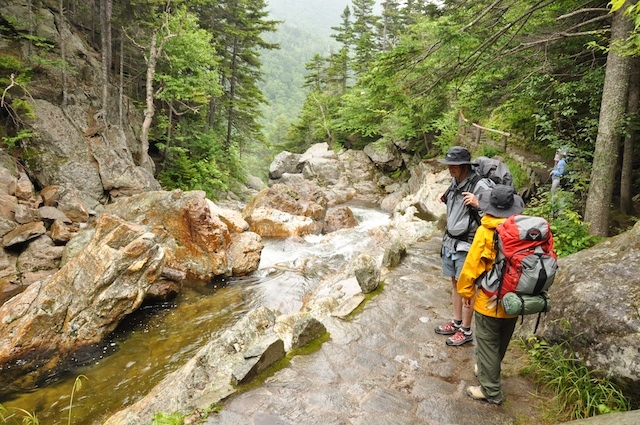 There are dozens in the White Mountains, and many of them can be reached in a mile or two of trail. A little rain wasn’t going to stop us, but alas, I had made a serious mistake when packing, by forgetting my rain jacket. A black plastic trash bag was pressed into service. I cut three holes in it (for head and arms) and off we went, sloshing up the muddy trails and spotting a total of four waterfalls in our first half-day of hiking. The garbage bag look is not the most attractive or impressive, but when you’re in the middle of the forest in a rainstorm, it works just fine. That evening the rain abated just long enough for us to fire up the camp stoves and make some dinner, and then resumed with more force for the rest of the night. The new tent was perfectly dry and I spent the evening in complete comfort, reading a novel by the light of my headlamp. I think that is my favorite moment of every tent camping trip: after a strenuous day of hiking, relaxing in the shelter with a warm sleeping bag, listening to the sounds of the outdoors (in this case, rain), reading or talking, with absolutely nowhere to go and no chance of being interrupted by a phone call. Our next day was marked by more rain and steady temperatures in the mid-60s, but I had noticed a worthwhile compensation. There weren’t any mosquitoes. 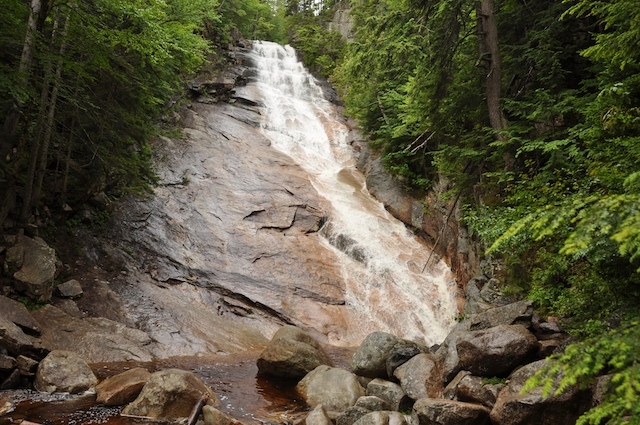 In July, to be hiking in the northern forest without any DEET on my skin, and not once hearing the skin-crawling whine of a hungry female mosquito about to bite, is simply unbelievable. I can’t recall a trip in the northeast I’ve ever taken when I wasn’t doused in bug spray, and yet on this trip conditions were absolutely mosquito-free. It was glorious. We hiked from the Ripley Falls trailhead all the way to Arethusa Falls, and then took a side trip on the Frankenstein Cliff trail, and back, for a total of 7.6 miles. The trail was occasionally steep, narrow, and brushy, but our intent was really to just get a good hike done while Susan and Adam carried full packs — this was their practice run for 8-mile days on the Chilkoot. All went as you’d expect. We came out with pantlegs and boots coated in mud, and feeling a bit sweaty from the humid air. Since we had accomplished our hiking goal for the day, and the rain had finally stopped, and it was still only about 1:30, we took the afternoon “off” and rolled around in the car to check out some of the White Mountain tourist attractions. Mount Washington was experiencing its 15th day in a row of 100-foot visibility at the peak, so we skipped the opportunity to drive to the top. North Conway was flooded with summertime tourists, so we headed down there to get a celebratory chai and sit on the sidewalk watching the people go by. After the chai was gone and our downtown stroll was completed, we headed off to another scenic point a few miles away. Susan asked if I wanted to take my camera, and it was at that moment that I looked in the car and realized it was gone. …. Yes, gone. Backpack, camera, lens, filter, everything. It took only a minute for me to figure out what had happened. At the end of the hike, I put the bag down on the ground near the car, and then drove away without it. So it had been sitting on the ground at the Ripley Falls trailhead parking lot for five hours. And the trailhead was 30 miles from our present location. Well, that was a long and quiet drive for the three of us, during which time I attempted to (a) remain calm, and (b) tally up the value of all the gear I’d just lost. It came to $1,800. But there was one comfort along the way, which was that we were in New Hampshire, and I had left the backpack at a trailhead. Hikers have a natural respect for other people, and other people’s property. I’ve never heard of anyone ever losing anything left in their tent. Trailhead break-ins are a plague at many other spots, but those are usually the work of non-hikers coming to plunder the vehicles of visitors. Sure enough, we drove up to the dirt parking lot and someone had propped up my backpack by the trailhead post where everyone could see it. The backpack, containing a new Nikon D90 camera, a Nikkor 18-200mm lens, a polarizing filter, and my food and Camelbak, was absolutely unmolested after five hours of being left out in the open. Hikers are great people. I slept well in my snug tent that night. Despite rain and potential financial disaster, everything worked out just fine. Tent camping gave me two days without the complexities of life, and reminded me of the things I take for granted back at home. Before we’d even broken camp, we were talking about the next time we’ll do this. There’s a chance we’ll get out again in the tents in late August, before the Airstream starts heading west. I certainly hope so. Most people go off for summer vacation, but for me it’s the busiest time of the year. In the winter there’s not a lot of Airstream activity going on, except on the west coast and in Florida, and we usually have large periods of time during which neither business or social obligation intrudes. That’s when we stretch out and have time to ourselves, but in the summer it’s usually go-go-go with rallies and travel. Not only that, but we have persisted in the habit of getting some of the routine annual jobs done here in Vermont. Our cars are registered here, since we aren’t actually legal residents of any other state yet, and so that means state inspections must be obtained every summer. Our dentist is here, a guy that is so likable and reasonable that we can’t seem to fathom the thought of finding someone in Arizona to replace him. Emma takes two weeks of swim classes here every summer. We still have a PO Box here, which still fills with mail despite two years of attempts to get people to stop using it. My table saw and some parts of our Caravel are here, so there are projects to be completed as well. This all makes summer in Vermont a little less idyllic than it would seem. “We spend our summers in Vermont” suggests a scene from On Golden Pond (filmed in New Hampshire, but most people don’t know the difference) with a rustic camp and boathouse on a still water lake. We would rise at 6 a.m. to watch the fog burn off the shallow water and listen to the early morning birds, while cupping a hot chocolate or coffee and wearing camp clothes. Then we’d retrieve the water melon from its icy cold spot in the fresh water spring, pack a picnic basket, and tromp off into the woods to spot deer, or perhaps putter around the lake in our 1930s wood boat. Reality is quite different. We are near a lake, yes, but parked in a 2005 Airstream in the gravel driveway. I do often rise early, but yesterday it was to get some work done before I went to the dentist to get an old crown replaced. My picnic for the day was a protein shake in the car on the way to do errands, carefully slurped to avoid drooling while the novocaine wore off. Our antique motor vehicle is not a romantic 1930s boat but rather the 1983 Honda Accord that we keep up here as our cheap runabout. My brother does have a Glastron GT150 painted in gold glitter, which qualifies as an antique boat, but somehow I can’t picture it puttering around anywhere without a vision of Roger Moore driving it (in Live and Let Die). I suppose “summer in Vermont” has changed in the 21st century. The other reason I am not relaxing much is because we have the Vintage Trailer Jam coming up in just a few weeks. We were finally able to post the preliminary schedule online today, and it looks good, but many details remain to be nailed down. If you are considering coming, better book your spot soon. We’re almost out of electric spaces. In about a week we’ll need to estimate the final headcount for the caterer and registration will probably close by Aug 7 (after that you can come as a walk-in but you’ll get a non-electric site). Perhaps later in August things will quiet down, but by then it will be time to start thinking about our departure. I am planning to head out in September. It remains to be seen if the rest of my crew is onboard with that plan. After a summer full of rallies, classes, appointments, errands, and county fairs, I hope they will be sated and ready for a change of scene. Maybe we’ll go somewhere where we have absolutely nothing to do. That sounds pretty good to me. 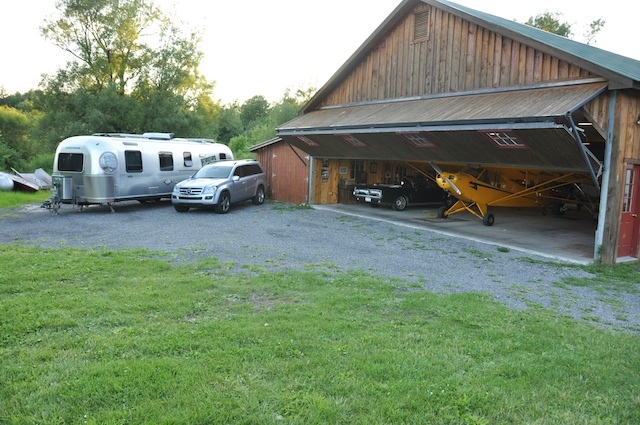 We are back in Vermont, parked once again at our summer home base. Our odyssey from Tucson has encompassed over 3,000 miles, 11 states, and one Canadian province. The Airstream is squeezed into its designated spot in the driveway, Emma is busy visiting with her grandparents, and we are all breathing a sigh of relief that we don’t have any more driving to do for a while. Normally when we pull into Vermont I don’t have that feeling of “too much driving.” But normally we take couple of months to cross the country, and this time our departure was seriously delayed by the car and hitch problems I described earlier. Our ideal schedule is to drive 150 miles or less, stay for 2-4 days, and then drive no more than 150 miles again. This time we had many 300+ mile days, and even one of 650 miles. Somewhere along the way, probably in Wisconsin when I was foolishly lifting my 9-year-old, I strained some back muscles and the resulting pain has afflicted me while driving for the past week. We’ve resorted to stopping along the road so that Eleanor can massage my back. This may sound blissful — pausing in the afternoon for a delightful massage in the Airstream bedroom — but trust me, you don’t want this experience. Eleanor’s massage was therapeutic and extremely painful. My friend Bill Reilly, who is a professional masseuse, says he can make any grown man “cry like a little girl,” and after having Eleanor treat my back I know exactly what he’s talking about. But for all the pain, her technique worked and kept me on the road long enough to get here. Our last day in Cazenovia NY was fine for Eleanor, Emma, and Brett, but lousy for me. Brett got a ride in the Piper Cub, including some wingovers, Eleanor and Emma walked trails on all 50 acres of the property where we were parked. At night our host cranked up his 1917 Calliaphone on the front porch and blasted carnival theme songs across the countryside. It was eery to hear the music late at night, but also sort of magical. Unfortunately, I had one of those overly-busy-and-filled-with-annoyance sort of day at the “office” and couldn’t really enjoy any of it. At the end of the day I was inclined to just hole up in the Airstream and watch a movie, while the rest of the group had dinner with our host. I probably shouldn’t have chosen the dystopian theme of “Children of Men” for that evening’s movie, but in a sense it was nice to see how much worse things could be. Things went a lot better on Friday, when we towed the Airstream across the beautiful Adirondack Park region and stopped in the small town of Speculator for lunch by the lake. The weather has, amazingly, improved to sheer perfection: sunny, 70s, dry and breezy. I say “amazingly” because the entire month of June in the northeast has been wet, wet, wet. The ground is still squishy in most places. Perhaps summer will officially start now that we are here. At least, that’s what my brother Steve suggested. He recently finished the restoration of a Glastron GT150, and he hasn’t been able to use it much with the crummy weather. But last night the conditions on Lake Champlain were very good and so he plopped the GT150 down in the water and we took it for a spin. It’s a tiny thing, and it skips over the water like a flat stone while going at speeds up to 50 MPH. Great fun. I have some more things to say about the trip in retrospect, including a report on the success of the GL320, but I’ll save it for future blogs. Now that we are at summer home base, I’ll be posting less than daily until Region 1 Rally (Aug 5-9, and I’ll be giving a presentation there on Aug 7), and the Vintage Trailer Jam (August 12-16). Going across the border is progressively less appealing every year. But I like going to Canada, so we put up with whatever the border agencies come up with. The crossing this time was about as expected: a 30 minute wait in line, then questions about our car (which is currently on a temporary registration from Arizona), and an inspection of the Airstream. The last is always the fun part. More than once I’ve been asked by US Customs this question: “What have you got in the trailer?” It always makes me pause, while I try to figure out what the “right” answer would be. It’s an Airstream, so the literal answer would be, “Everything,” since it contains all our personal possessions, plus all the components of a complete house. But I expect that would not be a welcome answer. It sounds flip, and might even imply that we are carrying a few bales of marijuana, three undocumented aliens, a nuclear device, and a six month supply of Canadian pharmaceuticals. So a Customs agent looked around inside and admired the interior, then asked me what I do for a living. I told him I publish the official Airstream magazine and his next comment almost made me laugh out loud. “That must pay pretty well.” Not really, I told him — it’s more of a lifestyle than a living. But I think he didn’t believe me. Like the guy yesterday at the diesel pumps, people will tend to believe their preconceptions before they listen to me. Other than the border, our only stop all day was a Flying J for the ritual Big Fill & Dump. Diesel for us, gas for Brett, full tanks of water, empty the black & gray tanks, fill up the propane. This routine takes about 20 minutes, after which we are fully prepared for boondocking. 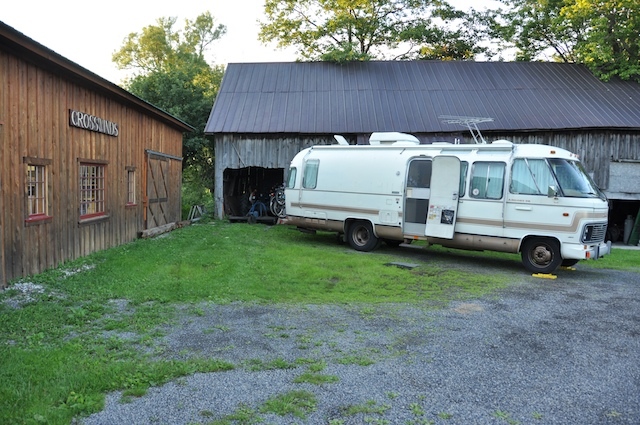 The next two nights we will be parked in Cazenovia NY, courtesy of our friend Randy Miller and his country gentlemen friend who owns acreage out here. Randy, you may recall, is the son of the famous Airstream photographer Ardean Miller. We did a big article on Ardean Miller’s iconic photos of Airstreams in the 1950s, 60s, and 70s, back in our Winter 2007 issue. It has been raining for most of June and early July in the northeast, and everything is still soggy. Venturing off gravel or pavement with a travel trailer or motorhome is asking to get stuck in clay. This meant our usual courtesy parking spot in Randy’s back yard was off-limits. Fortunately Randy was able to call one of his buddies and secure space for us to park on firm gravel, nearby. We are parked next to an airplane hangar, which contains a Piper Cub and two biplanes, all of which appear to be flyable. The hangar also has a vintage Ford Mustang, two wood powerboats, and parts of several other airplanes in various states of restoration. It’s like boondocking next to a really cool museum. Our purpose for being here is pretty vague. It’s just nice to drop in and see a friendly face on our way. Staying with Randy’s friend is an opportunity to make a new friend of our own, and in my opinion it’s always nicer to boondock on somebody’s lawn than to have full hookups in a campground. You never know what might happen when you courtesy park, which is a big part of the fun. The plan is to spend two nights and then proceed east. I’ll let you know how it turned out, tomorrow night.